Bureau, Cook (suburban and the city of Chicago), DeKalb, DuPage, Grundy, Iroquois, Kane, Kankakee, Kendall, Lake, LaSalle, Livingston, Marshall, McHenry, Putnam, Will and Woodford Counties. The PCA Midwest has once again produced its "one-of-a-kind" Regional Code Book featuring PLUMBING, ELECTRICAL & MECHANICAL CODE, and key contact information for over 300 municipalities. Ask almost any PCA Midwest member contractor or Plumbing Council contributing contractor and they'll tell you it is clearly one of the best values offered by any contractor association! 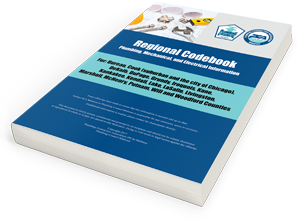 The 2019-20 edition is a completely updated and revised REGIONAL CODE BOOK (which now includes Chicago and unincorporated Cook County codes) and is offered as a Premium Contractor Advantage benefit exclusively available to Plumbing Council (PCA-Local 130 CBA) affiliated and contributing contractors (at no cost), as well as local municipal inspectors working in our jurisdiction. If you recall, previous editions were only available on CD or hard copy. This year, however, the PCA Midwest decided to utilize a more efficient route by having the code book accessible online. While searching this site, please note that each municipality has a separate “.PDF” file of its plumbing, electrical and mechanical information for access and download, as well as an “online flip book” version to easily view all of the “.PDF” files at once. Make sure to bookmark this page or add a shortcut on your office staff computers, tablets and smartphones to save time in the future. In addition, please contact any inspectors or municipalities if there is missing information and urge them to complete and return the online codebook form to the PCA Midwest. Questions about the forms can be directed to Barb Bigelow at . Once again, only PCA Midwest member contractors, Plumbing Council Midwest contributing contractors and local municipal inspectors working in our jurisdiction will be granted full access to these documents each time they log-in on our website. If you have any questions about this Premium Contractor Advantage or if you need to "retain or regain" your PCA membership or Plumbing Council affiliation, contact PCA Midwest and Plumbing Council Midwest Executive Director S.J. Peters at 312-563-9526 or e-mail him at . © Copyright 2019-20 Plumbing Contractors Association (PCA) Midwest • Plumbing Council Midwest. Every effort has been made to ensure that this information is accurate and up-to-date. Neither PCA Midwest or Plumbing Council Midwest is responsible for any omissions, errors or revisions. If additional information is needed, please contact the municipality directly. This document is strictly private, confidential and personal to its recipients and should not be copied, distributed or reproduced in whole or in part, nor passed to any third party. Doing so will result in legal action against the offender.